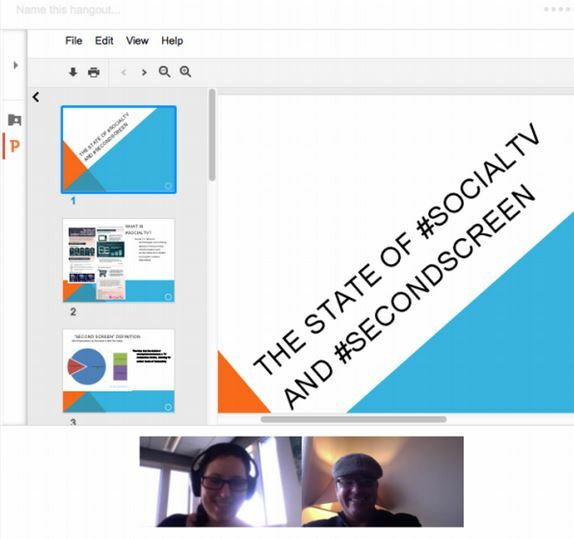 This semester, I conducted research for my Social Media Theory and Practice class on Social TV and the Second Screen market. Due to my past experience in entertainment and social tv, I was interested in what it could offer, and recently, there were a lot of changes. The hardest part was trying to figure out where to start my research. With the amount of information out there, I was a bit overwhelmed to begin with. I had to take an angle in order to filter out the information, and obviously I couldn’t present everything in a 20 minute presentation. I began gathering data from industry sources like Lost Remote, Second Screen Society, Trendrr, and more. I decided, after looking at all the data I gathered, to examine the state of the industry. As so much has changed so quickly in the past few months, I wanted to represent what Social TV is like right now, as it could change in a week. After determining what I was going to focus on, I needed to find industry leaders and experts to talk to and get their insights about the state of social tv. At first, it was difficult to find experts to speak with. However, after I began tweeting about social TV, I started getting responses to my inquiries. I had the opportunity to interview Mick Darling and Amy Greenlaw at Tomorrowish, as well as Michael Cupo at ESPN, and Kimber Myers at GetGlue. 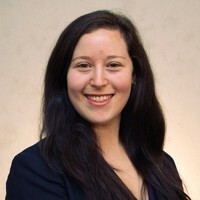 Being able to connect with individuals from different aspects of the industry was a great experience, and gave me a different perspective on how each sees social playing a role in what they do. As part of the collaboration process, I had a G+ hangout with my professor, Dr. Ward, to discuss the progress I had made in my research, who I had talked to in the industry, and other such things. After going through my presentation, and making some notes, we went through the features that a Google Hangout can offer. I had never really seen the add-ons before, but being able to watch a video together online, for example, is a pretty cool feature. In organizing and getting prepared for my presentation, we were encouraged to use pearltrees to organize the content we found. Although many of the websites and articles never made it into my final report, it was useful to have all the content I curated in one location, so I didn’t have to dig through a folder to find everything I wanted to reference. Below is my pearltree for Social TV. After presenting on April 25, my #2ndscrntv presentation hashtag had almost 70 thousand impressions, with 56 thousand accounts reached. But what does that mean? Reach is the total number of unique Twitter users that my search terms were delivered to (#2ndscrntv). Exposure is the total number of times tweets about these terms were delivered to Twitter streams. There is no guarantee that everyone who was delivered tweets saw them, but the potential for audience is there. 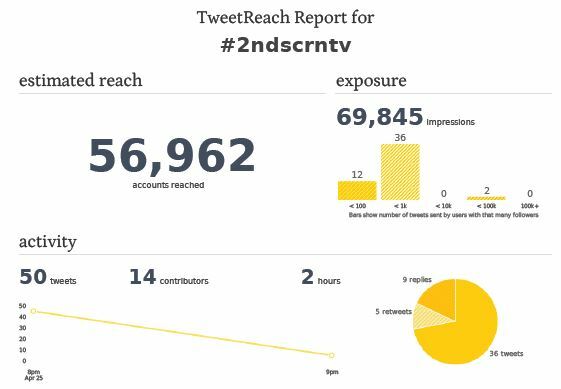 Below is a Tweetreach and SocialMention report for #2ndscrntv less than 4 hours after my presentation.